Surprising, modern, a bit more casual and “very stylish” – the Rilano 24|7 Hotel Munich. Rilano 24|7 – the thrillingly refreshing, creative and positive lifestyle hotels – in the city. This lifestyle hotel in the trendy “Parkstadt Schwabing” quarter offers 228 stylish rooms plus event and conference rooms for up to 400 people. The Rilano 24|7 Hotel München is in the new “Parkstadt Schwabing“ office center close to Leopoldstrasse. It captivates with excellent service, modernly furnished rooms and a passion for the latest technology. The Olympic Park, the English Garden and Allianz Arena are all quite close. The Rilano 24|7 Hotel München also offers an exquisite restaurant, cozy bar, modern cafe and pasta bar. In the “Vitello” Restaurant, the “Jazz Bar”, “Coffee Fellows” and “MammaMinuti”, guests can kick back, relax and enjoy our exceptional service. The Rilano 24|7 Hotel München offers 700 m² for events, plus a board room and 10 breakout rooms flooded with light. This is the ideal space for your meeting, conference or personal party: from the small circle of the elite upper echelon of management to an employee or sales event with up to 400 participants. Along with the most modern conference technology, we also offer wireless high-speed internet access. Our creative hotel kitchens will keep your guests’ spirits up – even during demanding conferences and seminars - with drinks, coffee and small snacks. It would be our pleasure to work up an individual package for you. Our hotel offers 228 completely refurnished rooms on 11 floors in the stylish Rilano 24|7 design. Coordinated down to the tiniest detail, the Rilano 24|7 Hotel Munich is done up in typical Rilano style – a chic, purist and welcoming atmosphere and the most modern amenities. Subtle grey and blue dominate all our rooms’ interiors, a color theme continued in the public areas and restaurants with skillfully added color accents in warm purple and lilac tones. All 228 rooms now offer our specially designed Rilano beds for a rejuvenating and relaxing night’s sleep, flatscreens, high-speed internet and much more. 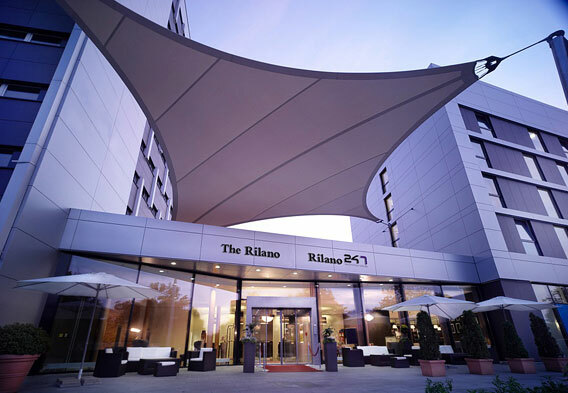 Come visit the Rilano 24|7 Hotel Munich and experience innovative, trend-setting hotel service that takes the lifestyles and needs of our technically savvy guests into account: online films and music archives, a complete web communications platform and an ergonomically designed workstation.